Are Olive Oil And Sunflower Oil Harmful For Babies´ Skin? Natural oils is a good healthy addition to our skin and hair care but, according to some Science news, that I read the other day on sciencedaily.com, presenting the results of a research led by The University of Manchester, application of olive or sunflower oil to the new born babies´ skin could be linked to problem skin conditions like eczema. So, let me give you a short presentation of this very interesting article I read. According to the writer, cases of eczema in children between the age of 2 and 15 in the UK have increased largely during the last decades, ranging from 5% in the 1940´s to almost 30% in our days. Trying to find the reasons for this, a pilot NIHR supported study was done at Saint Mary´s Hospital recruiting 115 new born babies that were separated into 3 groups. For 28 days, a few drops of olive oil were applied onto the babies´ skin of the first group twice a day. Similarly, a few drops of sunflower oil on the babies of the second group and no oil at all for the third group. The results showed that the development of the skin barrier function of the babies that were treated with the oil was delayed compared to the one of the babies that had no oil applied onto their skin. According to the researchers, if the skin barrier is not developed enough, cracks appear which let foreign bodies pass through such as allergens and infectants. So, the fact that the oil prevents the skin barrier from developing as fast as in the case of no oil being applied onto the skin could be linked to the appearance of eczema. 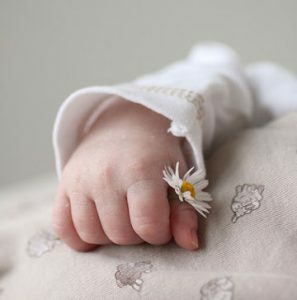 The writer also states that studies on babies in South Asia have shown that sunflower oil has an anti microbial effect which could be useful in the case of premature babies in developing countries but in the case of healthy babies in UK, the Manchester researches clearly state that they cannot recommend using olive oil or sunflower oil on baby skin. Finally, researchers admit that more researches have to be done using different oils on babies´ skin and their possible connection to eczema has to be further studied. Here I would like to add that, in their effort to protect the sensitive skin of their new born baby, most mothers are very willing to use different products to achieve that, but keep in mind that, a lot of times, even the products that are supposed to be specialized for babies´skin contain harmful chemicals and irritants. So, before buying anything, get more informed about those harmful skincare ingredients. For me, using reputable certified organic products on your baby or kid´s skin is the best solution.